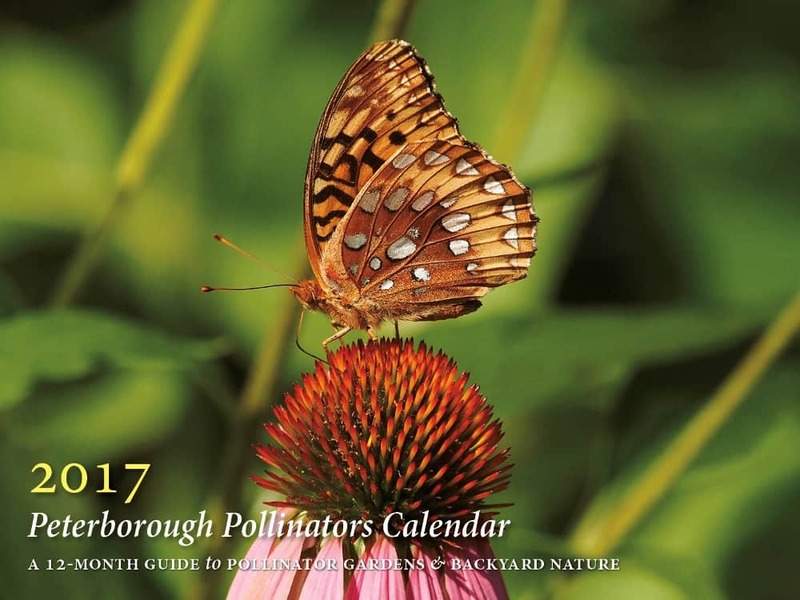 Join the Peterborough Pollinators 150+ Garden Challenge & get a free sign & calendar! Do you have a pollinator garden? 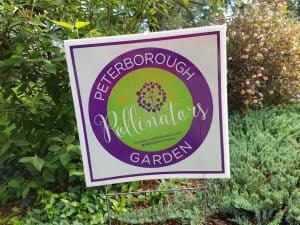 Would you consider registering the garden in the Peterborough Pollinators 150+ Garden Challenge? Our goal is to register 150+ gardens in Peterborough and area. This is a celebration of both the importance of pollinators and of Canada’s 150th birthday. If you register before the end of August 2017, you will also receive a free sign (see below) and a 2017 Peterborough Pollinators calendar. The calendar is a treasure-trove of information on pollinators and local garden resources. After you register, you can pick up your sign and calendar at GreenUp Ecology Park (weekends 10 to 4 pm & Thursdays 12-6 pm), located next to Beavermead Park on Ashburnham Drive. You will also receive a 10% reduction on the purchase of native plants. Alternatively, we can deliver them. 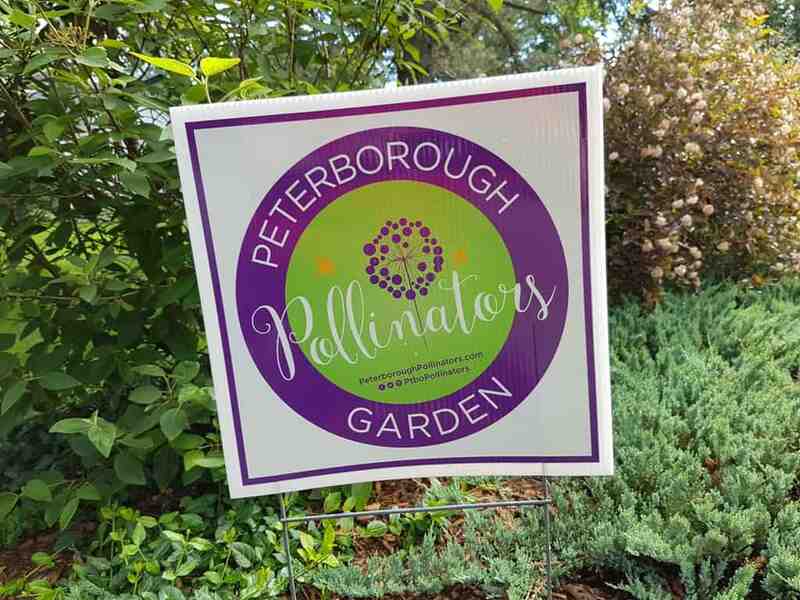 For more information, please visit peterboroughpollinators.com or send us an email Thank you for doing your part to help protect pollinators, and we look forward to seeing the sign proudly displayed in your garden. 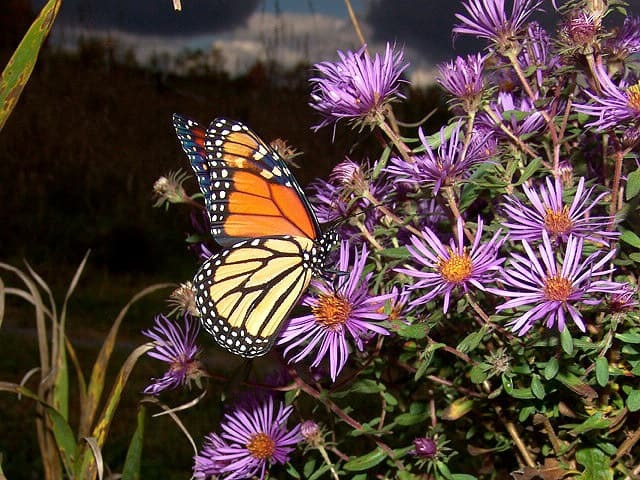 Please invite friends with pollinator gardens to participate, as well! One of the joys of tuning into nature is discovering the many amazing organisms that exist right under our nose and often go unnoticed until someone points them out. When it comes to flying under the radar, there are few better examples than Ontario’s native bees. 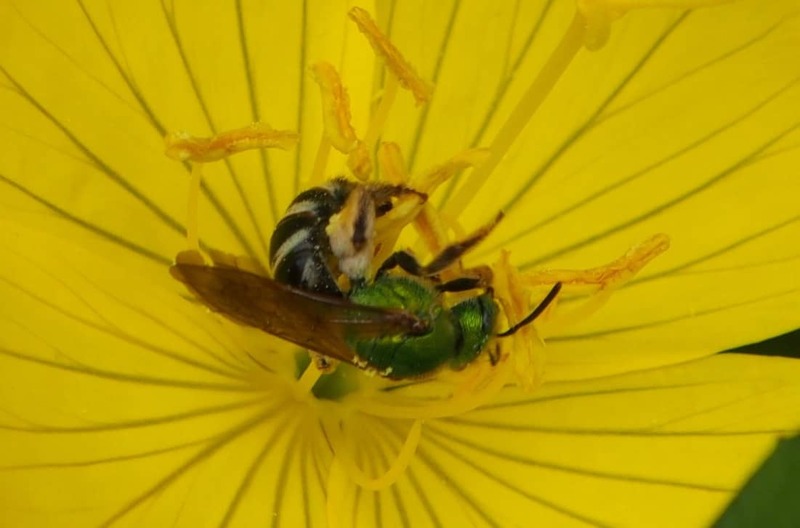 Susan Chan, a pollination biologist and expert on native bees, lifted the veil on this fascinating world when she spoke recently to the Peterborough Field Naturalists. 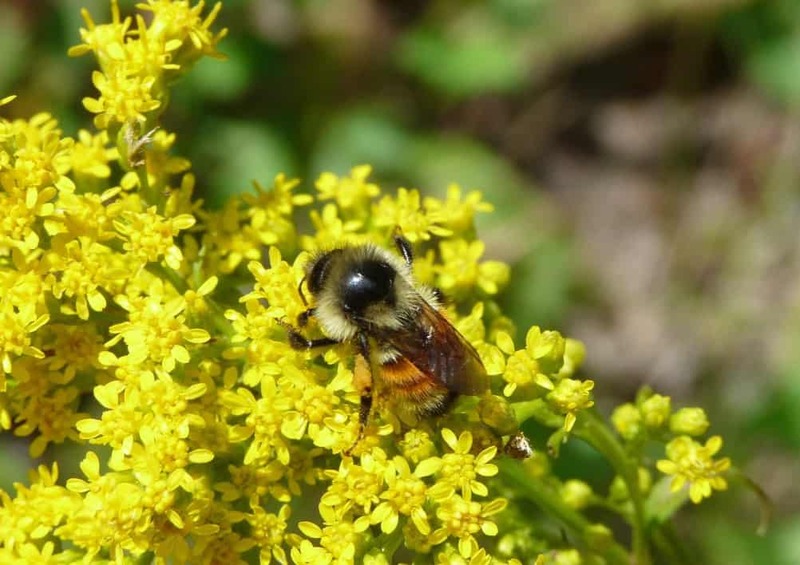 Susan is the program manager of an organization called “Farms at Work” and is working with regional farmers and landowners to protect and encourage these wild pollinators. 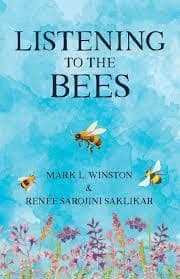 As Chan explains in her informative handbook “A Landowner’s Guide to Conserving Native Pollinators in Ontario” (available at Avant-Garden Shop) bees are keystone species in that they have a disproportionately large effect on the environment relative to their abundance. Thanks to their role as pollinators, bees provide an essential link in the reproductive cycle of plants and therefore help to feed and sustain all living things. Simply put, they allow us to eat. Anything that consumes seeds, fruits or vegetables, depends on pollinators. This includes not only human beings but countless other species as well. A few words about Honey Bees is a logical starting point to any discussion of pollinators. Native to Europe and Asia, Honey Bees are domesticated insects in much the same way that cattle are domesticated mammals. They have been bred over the centuries to serve humans. 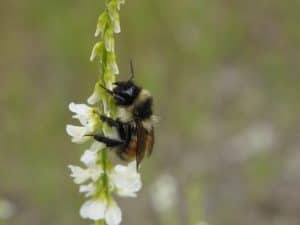 However, it now appears that much of the pollination work that is normally attributed to Honey Bees may actually be carried out by native bees and almost go unnoticed. Susan is therefore hoping to give our native bees the recognition, respect and protection that they deserve. In order to tell the story our native bees, we need to begin with the story of pollination itself. Its purpose is simple: to allow plants to set seed in their ovaries. First, a little basic botany is in order. The anther, or male part of the flower, produces pollen. 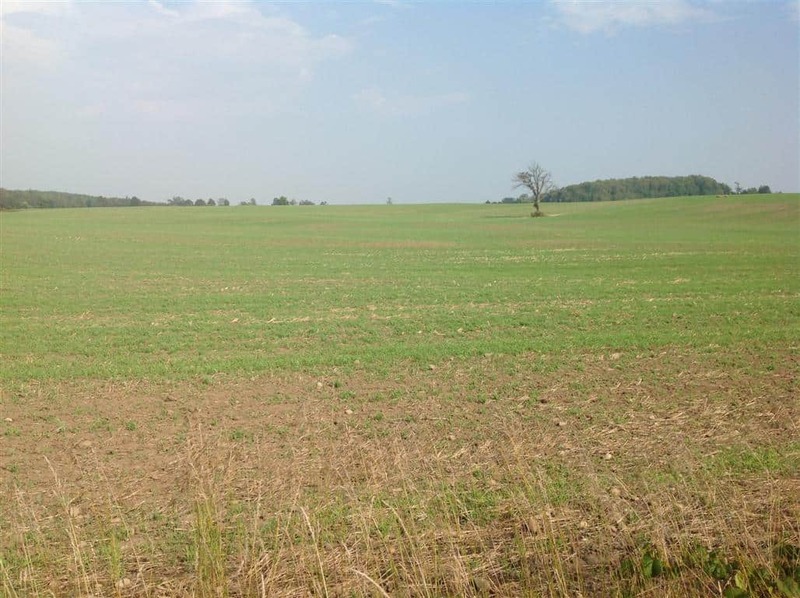 Pollen from wind-pollinated species like grasses and many kinds of trees is light and dry and therefore easily dispersed through the air. However, pollen from insect-pollinated plants like fruits and vegetables is oily and heavy, so that it will adhere to the bodies of pollinators. 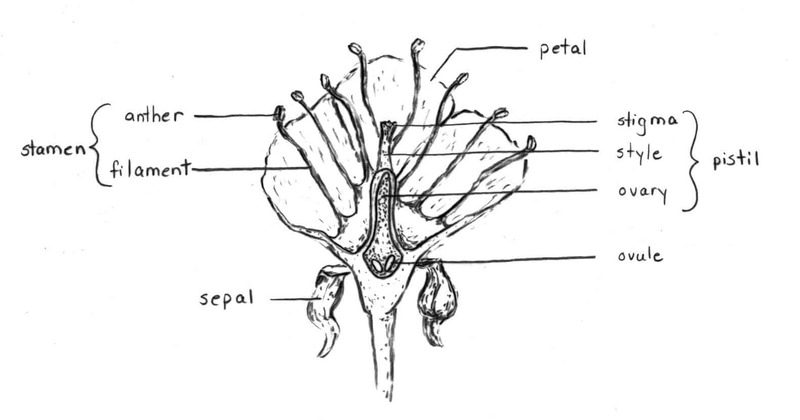 The female part of the flower consists of an ovary, which contains ovules. 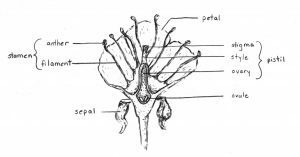 The ovary is connected by the style to a sticky structure called the stigma. At the base of most flowers there is also a nectar-producing organ called a nectary. Simply put, pollination is the transfer of pollen from the anther to the stigma, usually between two different plants of the same species. When a pollinator such as a bee brushes up against the stigma, pollen on its body may adhere to the stigma’s sticky surface. The pollen grain will then grow a tube down through the style to the ovary, where it fertilizes an ovule and produces a seed. Not surprisingly, there is a payoff for the insect, too. 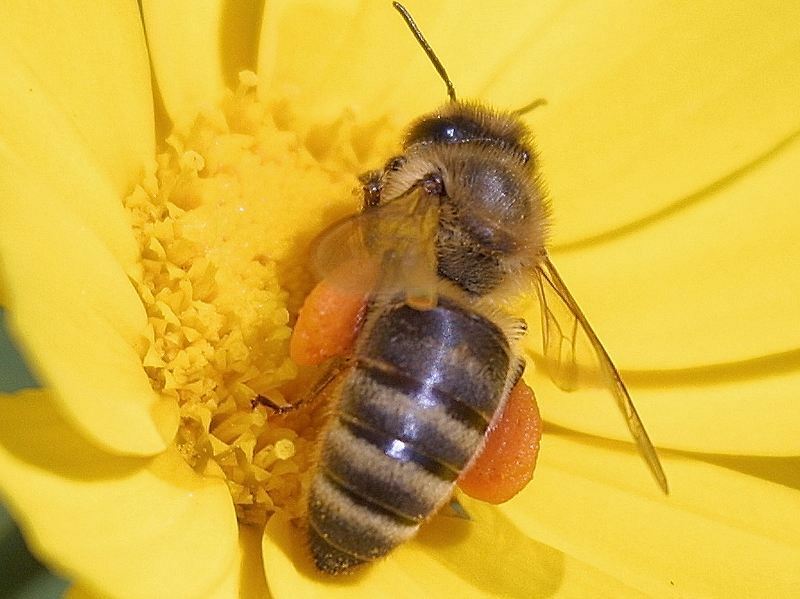 Nectar and pollen provide food for the bees – both for the adults and the larvae in the nest. The best insect pollinators are the hairy ones, and the hairiest of the insects are the bees. Their hairs pick up and hold on to pollen. Our native bees go one step further, however. They offer the added benefit of being active when Honey Bees – the “divas” of the bee world – don’t dare set foot outside the hive. Many of our native bees, on the other hand, are out at the crack of dawn, during cool weather and sometimes even in when it is raining. For example, squash bees become active at 4 a.m. when squash flowers open! So, who are the native bees? 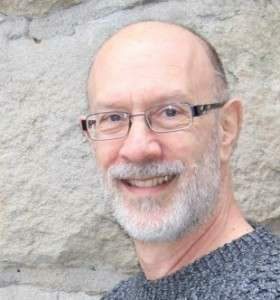 In eastern Canada, they are represented by some 400 species, grouped into five families. Of these, about 300 are important as pollinators. Unfortunately, most do not have common names, although they live and forage in fields and gardens throughout the Kawarthas. The five families are the Halictidae (sweat and pearly-banded bees), the Apidae (squash, carpenter and bumble bees), the Colletidae (cellophane and masked bees), the Andrenidae (miner bees) and the Megachilidae (leafcutter, orchard and mason bees). The majority of these bees are solitary, which means there is only one female per nest. In other words, most do not live in colonies. Nor do they sting, swarm or make honey. Bumble bees are the one exception. Numbering about 15 different species in Ontario, they can deliver a sting and they are colonial. 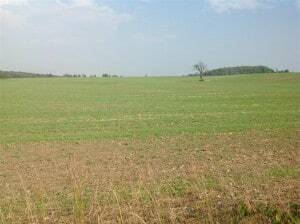 However, the colonies only exist for one breeding season, and the amount of honey the bees make is minimal. Although native bees can be found most anywhere there are flowers, identification to the species level is challenging. The only identification guide that presently exists is limited to the bumble bees. Entitled “Bumble Bees of the Eastern United States”, you should be able to download the PDF by going to http://bugguide.net/node/view/595902. Alternatively, you can contact Chan at sue@farmsatwork.ca and she will send you the PDF herself. This guide applies equally well to Ontario. Even the bumble bees, however, can be hard to identify. One reason is sexual dimorphism, which means that the male and female are often quite different in size and colouring. Queen bumble bees are large -think thumb-sized – and are the ones you see flying about in the spring. The small bumble bees that are so common in July and August are workers and are much smaller. Probably the most common species in the Kawarthas is the Common Eastern Bumble Bee. The thorax and thorax end of the abdomen are both pale yellow in colour. The rest of the body is black. You should also watch for the beautiful Tri-colored Bumble Bee. Two orange stripes on the abdomen make it quite distinctive. Native bees can be found most anywhere there are flowers. This includes perennial gardens and sunny meadows. Raspberry patches can be especially good, as can sunflowers. 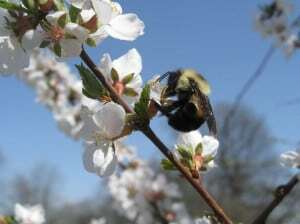 A great place to see bumble bees is at a blueberry farm in mid-May. 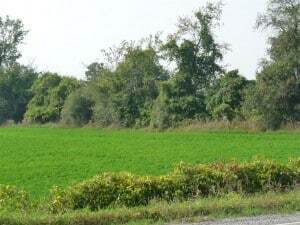 Kelly’s Berry Farm north of Bancroft is one such location. The tallgrass prairie and Black Oak savanna at Alderville First Nation also has a great diversity of bumble bees. Remember, too, that there are many bee look-alikes on flowers. Flower flies, for example, can look surprisingly bee-like. However, they have only two wings and hold them at an angle out from the body. Bees, on the other hand, have four wings. They are folded over each other and fit neatly across the back. Unlike flies, bees are also hairy. As for wasps, their bodies are narrow-waisted, slender and smooth. 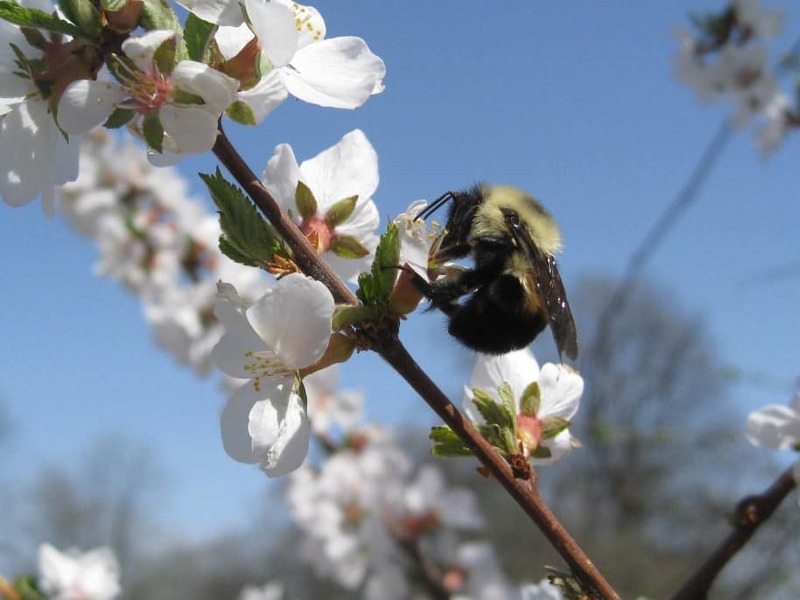 Next week, I will look at the life cycle of native bees, why they are vulnerable and how landowners can protect and encourage these wild pollinators.